I'm making my way to the 7-11. Solano Avenue seems suddenly endless. I have a lot on my mind. I'm in love. With you, Allen Ginsberg. And I couldn't care less! So, you are gay; I am straight. Oh, Allen, you must listen. You've no idea. We have so much in common. You love sunflowers; I love sunflowers, too. Along the winding streets of Berkeley. There are so many secret gardens! And now the moon blooms--almost full. Come on, Allen. Won't you, please, play your harmonium. Such music goes perfect with jasmine perfume. 1968; NYU; You're on stage; How you sing! Songs of Innocence and Experience. I'm one among the audience. Exposing your loneliest fathers' traditions. Look up. We're under the BART overpass. And now, let's sit down. There's no law against it. There's something I need to discuss. No pride can come between us. Come on. Sit closer. Face to face. Let me look deep into your four eyes through mine. What are the odds? Would we be smarter? So you are a Buddhist; I'm only me. We are that we are. We both are. Sometimes I can find no way out. I feel trapped inside my own skin. Believe me, it's not labyrinthian. We should do our praying in. My one prayer. My only prayer. That all my failures are worth all their trying. But tonight is young and the Häagen-Dazs beckons! Where are you? Oh, Allen! Why do you disappear? Under this summer solstice moon. So what if it's true everything is connected! So what if it's true everything counts! Quick. Look. Lick my fingers. 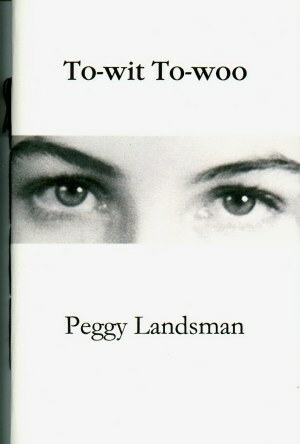 Peggy Landsman is a poet whose work has been widely published in both print and online literary journals and anthologies. This is her first chapbook. She lives in Pompano Beach, Florida. You can contact her at pajarita@bellsouth.net.